Also available in Electrocompetent format. 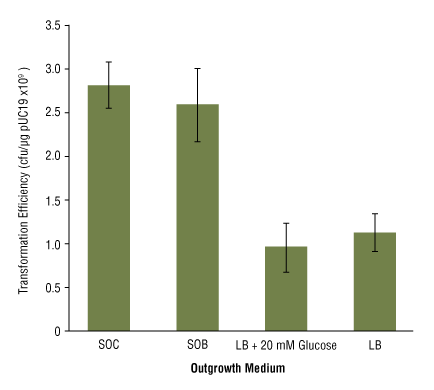 For C2987H, C2987I, C2987P and C2987U, SOC Outgrowth Medium is provided. For C2987R, Outgrowth Medium 1.5 is provided. 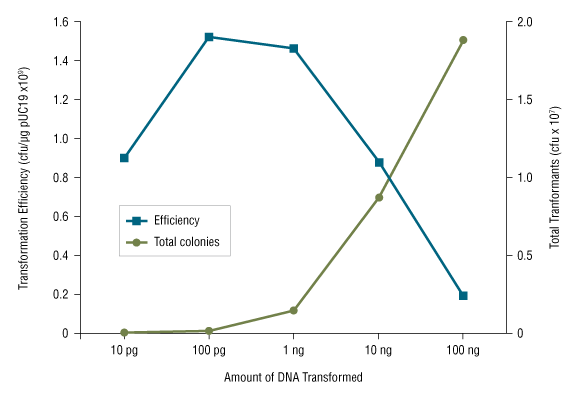 The optimal amount of DNA to use in a transformation reaction is lower than commonly recognized. Using clean, supercoiled pUC19, the efficiency of transformation is highest in the 100 pg-1 ng range. However, the total colonies which can be obtained from a single transformation reaction increase up to about 100 ng. 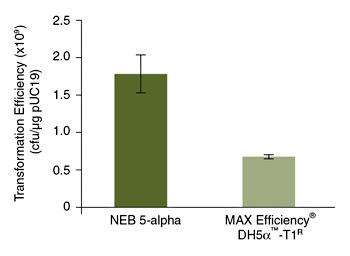 The transformation efficiencies of NEB 5-alpha and DH5α were compared using each manufacturers' recommended protocols. Values shown are the average of triplicate experiments. Competent cells should be stored at -80°C. Storage at -20°C will result in a significant decrease in transformation efficiency. Cells lose efficiency whenever they are warmed above -80°C, even if they do not thaw. SOC medium can be stored at either 4°C or Room Temperature depending on how fast it will be used. Storing at Room Temperature is convenient and adequate for short term usage (weeks to a couple of months). For long term storage, we recommend storing at 4°C. Please note that Outgrowth Medium 1.5 supplied with C2987R (1 x 384 well plate format) must only be stored at Room Temperature or crystals will form. Do you carry competent cells which are compatible with Gateway® Cloning? How can I increase transformation efficiency? 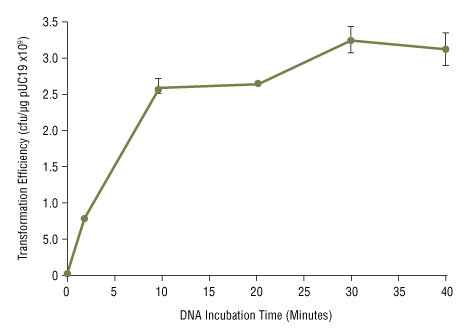 How long should I incubate cells on ice after DNA has been added (NEB #C2987H and NEB #C2987I)? How should I calculate the transformation efficiency (C2987)? What are the solutions/recipes (C2987)? What are the strain properties (C2987)? What is the difference between NEB #C2987H and NEB #C2987I? 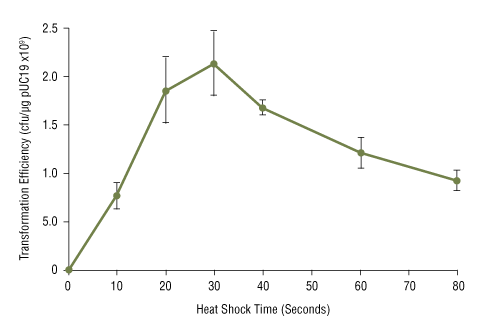 What is the optimal heat shock time for this strain (NEB #C2987H and NEB #C2987I)? What is the shelf life for this strain (NEB #C2987H and NEB #C2987I)? Can the 96-well plate format of NEB 5-alpha Competent E.coli, NEB #C2987P, be separated into smaller sections? How does the transformation efficiency of the 96-well plate format (NEB #C2987P) compare to the other formats? What is the optimal heat shock time for the 96-well plate format NEB 5-alpha Competent E.coli (NEB #C2987P)? What is the optimal heat shock time for the 384-well plate format NEB 5-alpha Competent E. coli (NEB #C2987R)? What is the optimal heat shock time for the 96-tube format NEB 5-alpha Competent E. coli (NEB #C2987U)?